A laidback, stylish tented camp with elements of explorer history on the edge of the Makgadikgadi Pans; Camp Kalahari is home to the habituated meerkat experience and is perfectly located to walk with the Zu’/Hoasi Bushmen and observe the zebra migration. 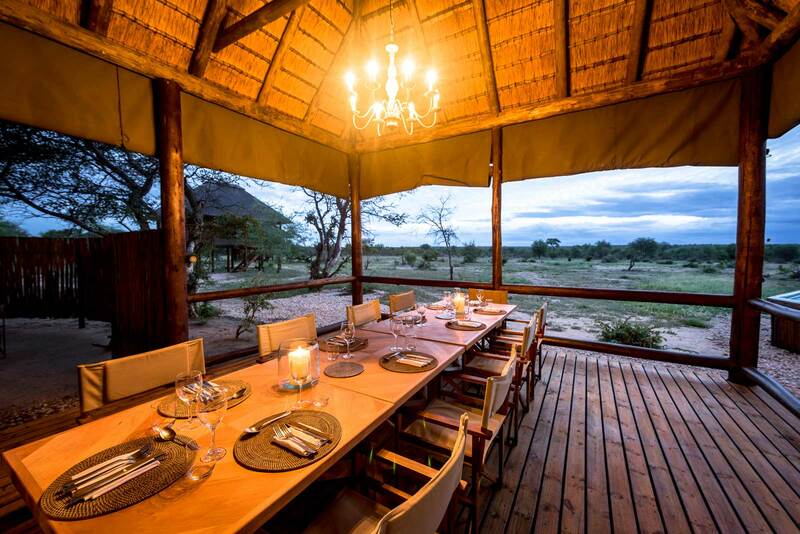 Camp Kalahari is located on Brown Hyaena Island on the brim of the Makgadikgadi Pans and it is one of only three safari camps in this one-million-hectare wildlife reserve. The style of this family-friendly camp is relaxed, yet full of precious items that are full of nostalgia and add to the unique identity of the place. 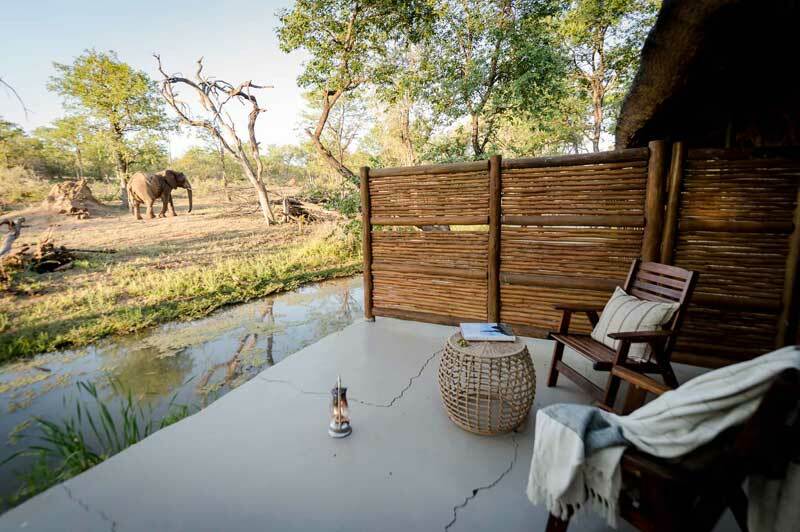 Each of the 12 Meru-style tented camps are raised on wooden platforms and have en suite bathrooms, outdoor showers, and balconies overlooking the palm-strewn and acacia-filled surroundings. Four-poster beds, leather and wood furniture, Moroccan rugs, and brass trinkets sew the look together beautifully. The meerkat activity at Camp Kalahari is world-renowned and is a very special part of the experience. Families travelling with kids of all ages are welcome and accommodated in two family tents, which have two inter-leading bedrooms sharing a bathroom. There is a strong cultural influence with plenty of African materials and textiles used in camp design, and the invitation to join the Zu’/Hoasi Bushmen on an enlightening walk through the wild. There is a swimming pool, no WiFi, and plenty of places and reasons to relax and enjoy the Kalahari in all its seasons. The activities on offer at Camp Kalahari make the most of every season in the desert through and are entirely unique, suiting adventurers and families with young children alike. During the green season, when the rains have transformed the dry desert and filled the pans with water, the enormously impressive zebra migration moves through the reserve. During the dry season from April to October, the spectacular salt pans reveal themselves and Camp Kalahari conducts its famous quad bike excursions to Kubu Island, which is a two-day adventure. All year round, guests can visit the habituated family of meerkats living in the desert, go on a one-of-a-kind walk with the Bushmen and discover how their ancestors lived for thousands of years. Game drives and horseback safaris are highlights of the Camp Kalahari experience, and wildlife specials include migrating elephants, brown hyaena, black-maned lion, cheetah, bat-eared fox, aardvark, and aardwolf. 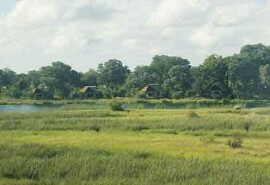 Nxai Pan Camp is one of the only permanent camps in the Nxai Pan National Park. In addition to the chance of seeing large giraffe herds, guests can expect to see numerous springbok and perhaps the endangered wild dog. 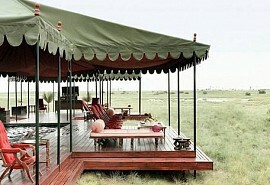 Jack's Camp is located nearby the Makgadikgadi Pans and offers a truly unique safari experience in Botswana's Kalahari Desert. Walks with San bushmen as well up close encounters with wild meerkats are highlights. 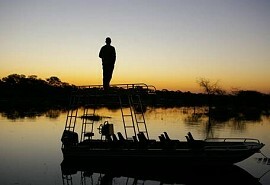 Leroo La Tau Botswana safari lodge sits high on the edge of a waterhole, where many desert animals come to seek water. 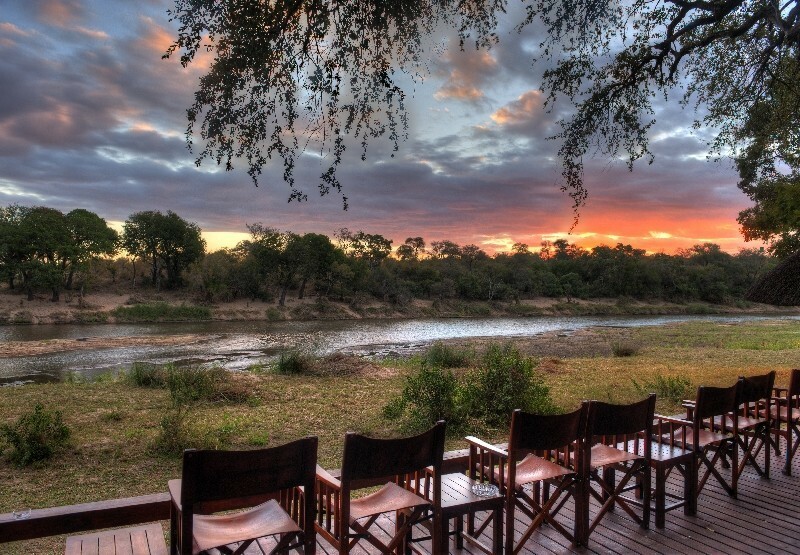 It offers wonderful views of the Boteti River, over the riverbed and the grassy plains beyond. 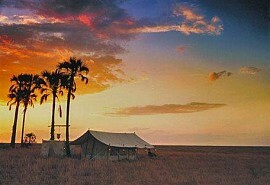 San Camp is a seasonal camp located close to the Makgadikgadi Pans National Park. Visits to the local meerkat colony as well as San bushmen walks are highlights of the camp. Unravel Historic Mysteries - venture out on quad bikes and explore remote archaeological sites. Meno A Kwena Tented Camp is set on the banks of the Boteti River and offers guests a wonderful traditional safari experience. 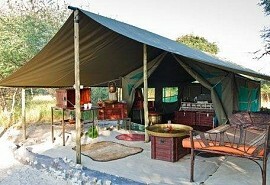 Owner run and managed, the camp is suited to guests seeking a personal touch. 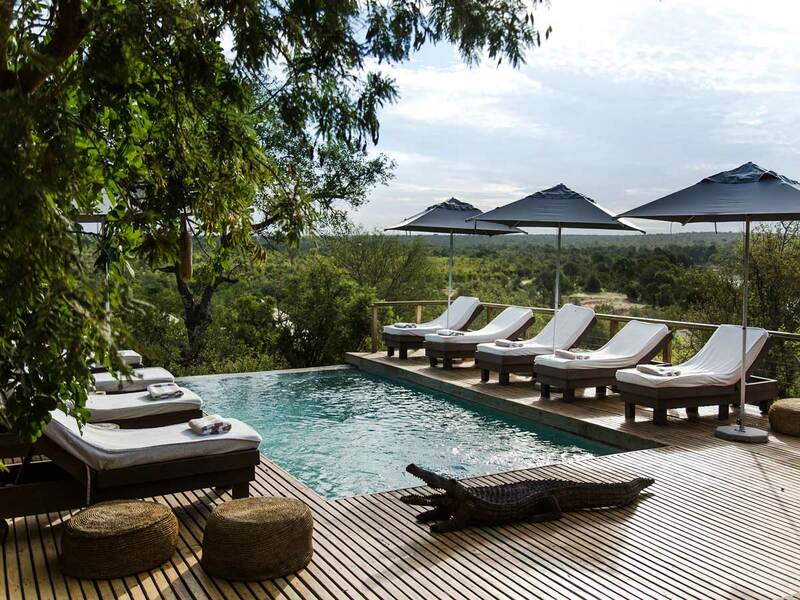 This 12-night luxury safari offers guests the opportunity to explore the best of Botswana & includes the vast Central Kalahari, the world renowned Okavango Delta, the beautiful Linyanti Reserve & the Namibian Caprivi strip. 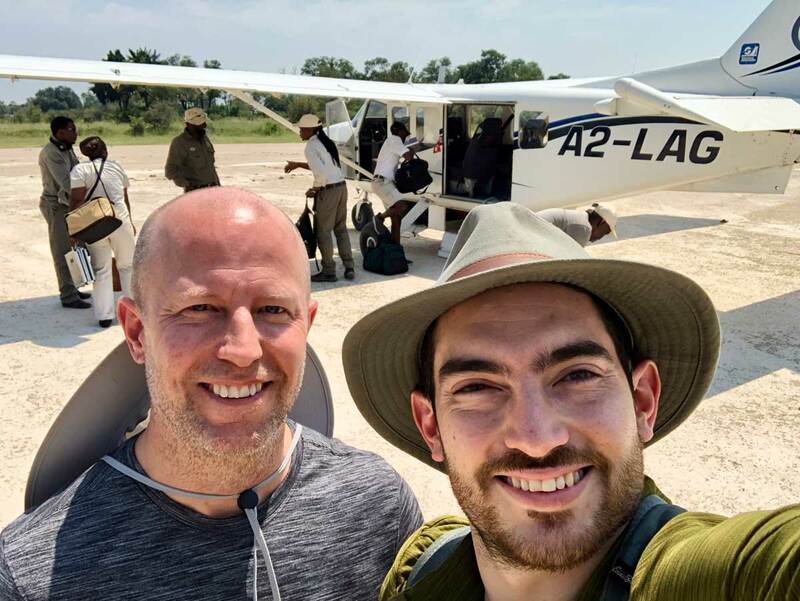 This premier safari offers guests the opportunity to explore the highlights of Botswana & Victoria Falls and includes the world-renowned Okavango Delta, Moremi Game Reserve, and the Linyanti Reserve. 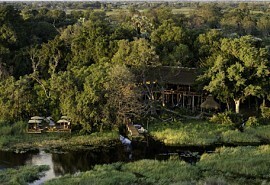 This premier 6-night safari offers guests the opportunity to explore 3 different regions of Botswana including the wildlife highlights of the unique wetlands of the Okavango Delta.